Six days after the ball dropped in Times Square, Andre Dawson got the best New Years gift imaginable for someone who made a career out of dropping baseballs into the cheap seats of stadiums around the league…admission into the Major League Baseball Hall of Fame. 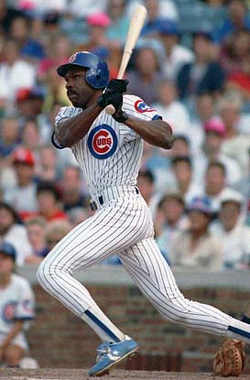 One of the league’s most dominant power hitters while playing as a Cub (1987-92), “The Hawk” hit 438 career home runs, was an eight-time All-Star, won eight Gold Gloves, and claimed NL MVP honors in '87. “Awesome” Dawson waited nine years after retirement for HOF voting to swing in his direction. Last year he finished 44 votes short when Rickey Henderson and Jim Rice were elected. But this year he was named on 420 of ballots (a jump of 59 votes) -- good for 77.9 % of the vote. His induction into Cooperstown, scheduled for July 25th, offers convincing evidence that Baseball Writers Association of America voters are still enamored with players who exhibited raw power at the plate to go with solid fielding skills. This is very good news for 500 Home Run Club® members including: Sammy Sosa, Mark McGwire, Rafael Palmeiro and Barry Bonds who are now retired from the game and hoping to get a similar call from the commissioner’s office sometime in the next decade. 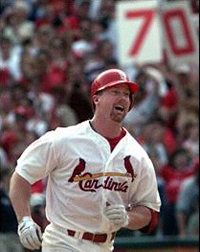 Despite having more homers (583) than all but four Hall of Famers (Hank Aaron, Babe Ruth, Willie Mays and Frank Robinson) Mark McGwire received just 128 votes (23.7 percent) in this his fourth year on the ballot. While that’s 10 more than last year, gaining HOF entry will require patience and a more than a little fence mending with baseball pundits. “Big Mac” recently demonstrated a knack for both by accepting Tony LaRussa’s offer to return to baseball as hitting coach for his beloved St. Louis Cardinals, (see 500 HRC Legends Share Batting Skills With Younger Players) and, perhaps more importantly coming clean with the baseball world and fans around the globe by admitting that he used steroids as a player. Fans seemed ready to begin forgiving McGwire for his past indiscretions when they gave him a warm welcome at a promotional event the Cardinals scheduled to highlight his new role as batting instructor for the team. Some critics maintain McGwire is not Hall-worthy because he was a one dimensional player…a ludicrous claim considering that he captured a Gold Glove for his stellar play at first base in 1990, led the league in walks twice, and compiled an amazing .394 OBP (64th highest all-time since 1901). Only time will tell, but we’re rooting for you Mac.